Perhaps Dennis Eckersley put it best - "Yuck." The Boston offense was held to just four hits last night by four Mariners pitchers as they fell to Seattle 4-0. 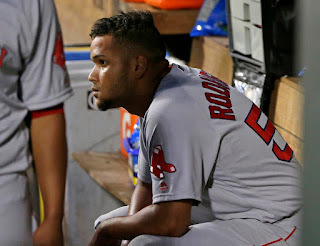 Eduardo Rodriguez (pictured) started for the Sox and went 5.1 innings allowing all four runs, three of them in the bottom of the second inning. He gave up six hits and walked two while striking out six. The lone bright spots for the Red Sox? Jackie Bradley Jr. had two hits and Doug Fister came out of the bullpen and pitched a 1-2-3 eighth inning.